Studious bellas who sacrifice a good night's sleep to pass their quizzes. Determined workaholics who spend the night getting the right numbers for an impressive presentation due the next day. Loving moms who are wide awake at night for their babies and little kiddos. I know, I should be patting you on the back for a job well done, but I am actually about to scold you! God help your eyes!!! The eyes must be the most beautiful feature that one can ever have ( as they say, the eyes are the windows to one's soul ). Whenever you lose sleep, your eyes get strained; less oxygen is being circulated, and you get dark undereyes as a result. Dark undereyes mean the dark color drags the eyes down, making you look tired, haggard, and older. Totally not a good thing. To be totally honest with you, this is one of the hardest problems in the beauty industry! It's hard to undo, and you can only do so much to cover those dark sagging circles under your eyes. 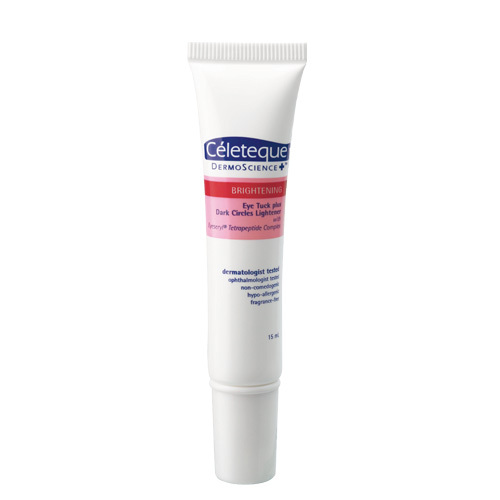 As to address the current situation, Celeteque has come up with a product called Celeteque DermoScience Brightening Eye Tuck plus Dark Circles Ligtener. *Proven and backed up by an open clinical trial conducted among women aged 30-60 years old with puffy eye bags and dark under-eye circles. It tightens the area around the eyes to keep lids from sagging, which is inevitable with age, and it also brightens the surrounding areas, keeping the eyes well-hydrated, supple, and youthful. Oh, the world is a better place again! So if you're really bent on spending late nights on your must-do's, do keep a tube of this wonder product that would help save your eyes. Oh, we do have samples available right now for grabbing! Have you gotten one yet? After cleansing, gently dab on and spread CELETEQUE DermoScience™ Brightening Eye Tuck plus Dark Circles Lightener around eye area using your index finger. Use everyday, in the morning and at night.